7"H Resin figures. 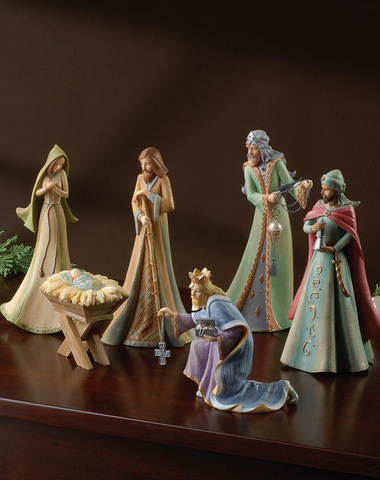 6-Piece set includes Jesus, Mary, Joseph & the three wise kings. This beautiful 6-Pc Nativity Set celebrates the precious birth of Jesus with several classic figures. The figures are captivating with their expressive details and exquisite color palette. They have that special charm that Gina ads to all of her collections. This is a special set to honor and celebrate the true meaning of Christmas.